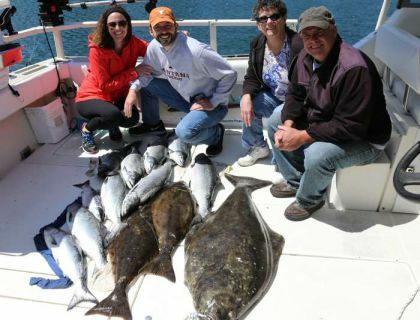 We believe the salmon and halibut fishing in Ucluelet is some of the best in the world and along with our experienced guides we will guarantee you will have a successful trip. 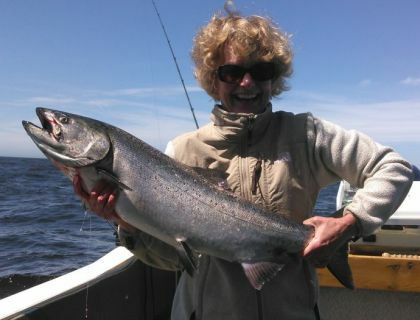 Ucluelet may just be the best kept secret in the world of salmon and halibut fishing. We would say that it is a salmon highway where you just happen to get some good halibut fishing thrown in. Our guide team has consistently placed in the Salmon Ladder Derby since its inception in 2010. You may not want to catch a derby winning fish, but you’ll sure enjoy reeling in a screamer that takes your breath away! Our guarantee applies to our three or more day Silver and Gold packages and if you find any guarantee that you think is better we will match it provided you tell us upon booking! You will catch Chinook (Kings), Coho (Silvers), and halibut. Because of our very experienced guides, Salmon Eye Charters can offer this guarantee with little risk. All our guides have years of experience guiding. We know you will be with the best and this is why we are confident enough to guarantee it. We Guarantee 50lbs of Salmon and Halibut! We not only guarantee you will catch SALMON and HALIBUT on your fishing package, but lots of them. We guarantee that you will catch at least an average of 25 lbs per day per person of caught salmon, halibut, ling cod and Red Snapper (this means salmon, halibut or ling cod that are brought up to the boat) up to 50 lbs per day per boat in any 3 day fishing trip from July 1 to August 31. (This does not include Rock cod or any other type of bottom fish that can be a last resort in many advertised fishing spots). 50 lbs means at least 50 lbs of weighed salmon and/or halibut in the boat. If you don’t catch the advertised amount, we will match the pre-portioned catch in fresh, vacuum-packed salmon and halibut. Salmon fillets are approx 55% of the weight of the salmon and we would make sure you have a minimum 80 lbs of fillets over three days. (In the unlikely event that this should happen, we will also let you fish longer, but if that fails we will give you the proportioned salmon and halibut to get you on your way with what you came for. Why do we do 3 days for a guarantee? One thing you can’t guarantee here is the weather off shore. Some days the weather is such that fishing in protected water is the best option for the enjoyment and safety of our guests. Sometimes the fishing in protected water is slower than offshore, but we want you to be guaranteed even on these days. Experienced guides still catch salmon in areas of protected water when others aren’t. Let our experienced guides get you the fish you have been waiting for the moment you booked your trip! Why do experienced guides matter? Some people here claim to have been in business here for 30 years (not possible since one of our guides is the only guide left out of the original few that started guiding here in the mid 1980’s). It matters how many years experience your guide has, not how much the owner claims to have. Experienced guides know how to catch salmon and halibut in all conditions, not just when the weather is right and the fishing is great off shore. What will would you catch for a 1 or 2 day trip? You will still have the same chance at getting limits of salmon and halibut and you will still be guided by an experienced team of guides. The guarantee was set up for those who have been disappointed from past fishing trips and who don’t want to take that risk again. Check out our latest fishing reports as well as our picture blog and you’ll see that we consistently catch large amounts of fish. When choosing a charter or fishing resort, make sure you look for current pictures, not a picture taken one lucky day 10 years ago! Our website is full of photos, videos, guest testimonials, and information to help you make the best decision. Take your time, read, watch, and please feel free to contact us with any questions or concerns. We’ll be happy to put you in touch with past guests who can tell you what fishing with us is all about! That’s the reason we offer our Triple Guarantee. But catching fish is just part of the experience. The more we can do to send you home with good memories (video, picture book, smoked salmon, well packaged salmon, etc.) the better. Almost 50% of our business comes from south of the border and not one guest has reported any issues with getting fish back home. As long as you have a passport, there should be no problem. We will make sure you catch salmon and have fun, no matter how many black cats have crossed your path!